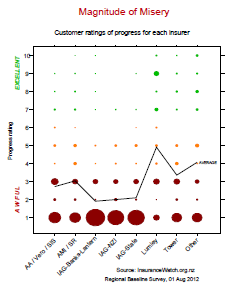 InsuranceWatch - Who are we? David Stringer comes from a corporate background in pharmaceuticals, speciality chemicals and medical devices. He is a current school BoT member, Chair of Ferrymead-Brookhaven Residents Association and member of the Coastal Hills Cluster committee, which covers residents associations from Ferrymead to Sumner. Linda Rutland is a community organiser and fundraiser currently working in Mt Pleasant as an Earthquake Recovery coordinator. Peter Hyde is a web and software company director helping out with the Redcliffs Information Centre and other quake-related community initiatives. Tony Aldridge is a statistician with experience in analysing and solving a wide range of industrial problems. Vicki Hyde is the former chair and current media liaison for the NZ Skeptics, and an author, editor and science journalist involved in local community projects. Don't miss our News & Resources page! The information on this website is provided without any warranties. InsuranceWatch and its members do not undertake any duty of care to any reader of information on this website and thus cannot be sued in negligence or otherwise in relation to that information and any advice provided. "Had a change in case manager recently and that seems to have helped a little in terms of communication (but still no action). Our land has been green since last Sept but insurance have essentially done nothing to progress our repair/rebuild apart from recently hand claim over to PMO who say they will see us in about 3-4 months. The planning process for our rebuild should have started the day after the land reports came out but insurer have endlessly delayed. We don't understand why they don't actually treat us as the priority everyone agrees we are, e.g why are others 'less needy' from home and financial point of view ahead of us in rebuild? We feel it is possibly because our house is an expensive rebuild and they want us to end up taking a lesser value cash settlement - what other logical reason could there be? We (by virtue of our house location) know lots of homeless families, with various insurers, and no one seems to be getting any real action re repairs/rebuilds - just bits of paper shuffling. 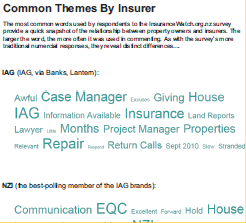 If EQC would only have 10% of the empathy and understanding of AMI had, we would come a long way. They now prefer to send some-one into bankruptcy by delaying decisions. "We have been dealing through our Broker. But even they have trouble getting answers from our Insurers. Would love to make some progress with regards to when the rebuild can start or for at least to start making plans. Like everyone else, life is in limbo and there is no moving forward. "No Issues good all round service. Can there please be agreement by all insurers that those out of their homes MUST be actioned first (I feel for white zoners not in their homes - are they going to unfairly end up at back of queue while others get cosmetic work done?). The financial implications of not being in one's own home are enormous and coupled with being dislocated from one's community, this is having a very tangible effect on our health.